A visit to Italy is not complete without visiting Rome, the eternal city. Traveling to Rome from Florence is relatively easy and inexpensive by taking the Italian express train, Freccia. A second-class ticket is less than 50 euro and will take 1½ hours (one-way) to get you from Santa Maria Novella to Rome Termini (respectively, train stations for Florence and Rome). Upon arriving at Rome Termini, I took the escalator to the Metro. For 6 euro you can ride the Metro for one day and stop to tour many of Rome’s most famous sights. My first stop off the Metro was the Colosseo (the Colosseum). I must admit when I arrived the line of tourists looked forbidding and I almost bailed for a cappuccino. After spending several minutes in the no reservation queue, I found out that I could skip the line altogether by going to the Guided Audio Tour ticket window and for 15 euros get a ticket into one of Rome’s most ancient monuments. Be prepared to marvel at the architecture of this magnificent arena. See more ways to skip the Colosseum ticket line. From the Colosseo, walk towards the Foro Romano (Roman Forum), the old heart of the Roman Empire. You will stroll by temple ruins, basilicas and a few meters more, museums on Capitol Hill. Make sure to wander throughout this visual wonderland, a testament to the power and strength of the mighty Romans. The Colosseum ticket now includes admission to the Forum. Next, head towards the Fontana Di Trevi, the Trevi Fountain. It was crowded as expected with countless tourists but still a visual feast for the eyes. The Baroque fountain of Neptune is a famous gathering spot and an excellent area to grab gelato, Italian ice cream. The Pantheon is a brief 5-10 minute walk from the Trevi Fountain and offered another glimpse of the splendor of Rome. The last visit on my Roman tour was the Spanish Steps at Piazza Di Spagna. 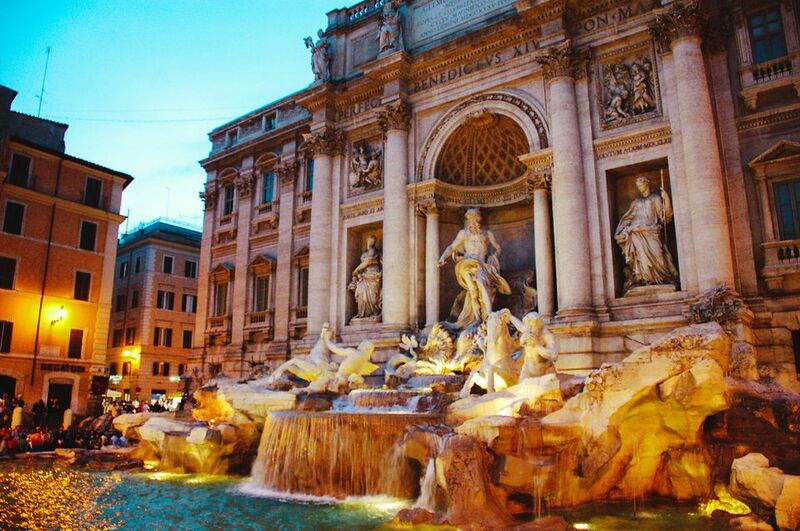 It is another famous meeting spot for tourists who can be heard excitedly chattering about the wonders of Rome. The Metro is located nearby and quickly transported me back to Rome Termini for my return trip home to Florence. Walking Rome is easily manageable with a map of the city, sturdy walking shoes and the desire to explore what the Eternal City has to offer!